As parents, we want our children to develop into intelligent little people. We want them to be healthy and strong. Make use of play time to get that critical Vitamin D and help promote cognitive development in early childhood with outdoor activities! Here are seven ideas to do just that. Most of these are best suited to children ages 3-7, but you can make changes to them to make them more challenging or interesting to older children as well. Work with your children to create boats out of different materials such as paper, foam, or anything you can find around the house. Take the boats to whatever water is nearby, but running water like streams work best. This activity gets kids thinking about what floats and sinks, the water cycle, and encourages problem solving. Take your kids to a location where you can find lots of rocks. See who can build the tallest tower by stacking them! The uneven sizes and surfaces of the rocks forces kids to think creatively and learn about balance and size. This game can become frustrating for impatient little ones, so make sure you are encouraging and working together. Giggle at the towers that topple and have fun with it! This is a variation on the classic ‘Eye Spy’ game. But rather than just seeing, you send the kids out to touch something. For example, ‘Touch something red.’ Depending on your playground equipment design, this can be a shape, color, or location. This game encourages observational skills and vocabulary, as well as gets the kids moving! This game is best on outdoor play equipment, as it gives you many options on how to play. Simply take turns with your child doing an action, such as climbing up the slide, or crossing the monkey bars, while the other tries to copy. This teaches kids to be open to possibilities and to observe carefully. Get creative in your use of all the pieces of equipment! Using household objects, try having the kids roll different objects up or down the slide. What shapes work best? Do heavy things work better or light things? Older kids can use this opportunity to discuss gravity, and the younger ones can observe that things move differently depending on shape and weight. For that day that you do not mind doing baths and laundry, try some messy mud play. Make up mud pies in bowls. See what happens when they dry, and see what happens when you make mud with more water or less water. This is a great way to talk about evaporation for the older ones, and to see how solids and liquids act when they are mixed together for the younger ones. Just make sure you keep a good eye out so nobody decides to take a bite of mud pie! This activity is a bit better with kids four and up. Have them pick three objects from the yard without telling them what the objects are for. After they have gathered them together, challenge them to tell a story using all three objects. This works great in a group as well. Have them each tell part of the story, or have them exchange objects to make their stories work out better. This game encourages creative thinking and vocabulary. If the younger ones have trouble with the story, allow them to walk around again to switch out an object to avoid frustration. Outside time is great opportunity to get out some energy, soak up some Vitamin D, and broaden a child’s mind. 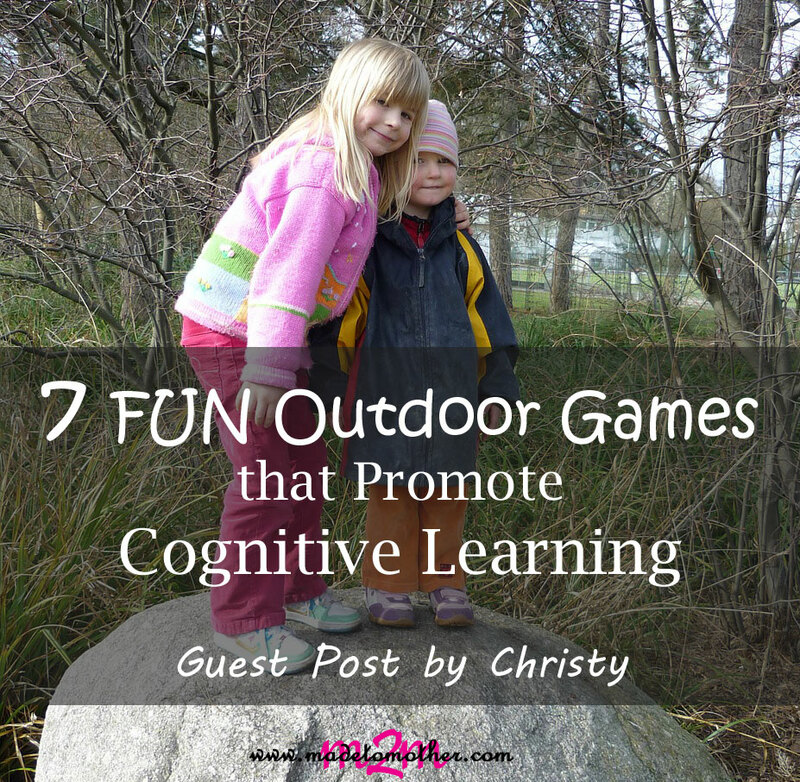 With a little thought, you can create your own fun, outside games to play that also help develop your child’s mind. After all, teaching a child with games is the best way to foster a love of learning and keep the kids happy at the same time. Good luck and don’t forget that parents should have fun too! As a single mother of two. Christy McNeil is lucky enough to have been given the opportunity by her employer to work from home, which helps a lot even though her eldest is in school. She is also writing for Kompan, the world’s no. 1 playground supplier that provides outdoor playgrounds and playground equipment as well as swing sets.